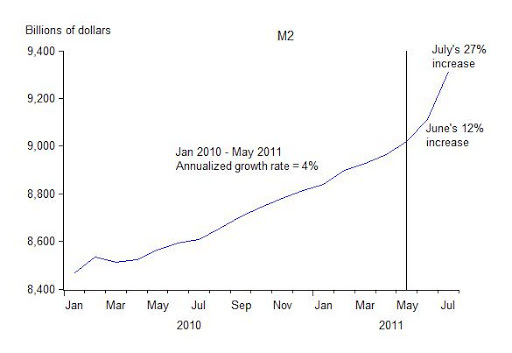 Why the M2 Growth Spurt? Quantitative Easing (both I and II) has caused the monetary base—the sum of currency and bank reserves—to explode in the past three years, but has not resulted in similarly large increases in the growth of broader measures of the money supply such as M2. Instead banks have largely held the extra money that the Fed created in order to finance its purchases of longer term Treasuries and mortgage backed securities. You can see this in the following time-series chart. 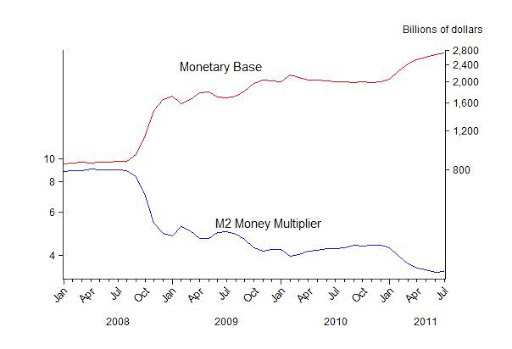 As the monetary base (right scale) increased sharply, the ratio of M2 to the monetary base—the M2 multiplier (left scale)—has moved in the opposite direction in complete lock-step fashion. 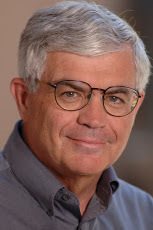 Thus changes in the multiplier have offset increases in the monetary base. But if you look closely at the lower right of the graph, you can see that this pattern may have shifted recently as the M2 multiplier increased. In fact, over the past couple of months, M2 growth has spurted, as you can see in the next chart showing monthly M2 averages through July. It’s important to find out why. Is quantitative easing finally leading to a rapid increase in the supply of the broader money aggregates? If so, the Fed will need to be concerned about the ultimate effect on inflation, and perhaps start reducing the size of its balance sheet (and thus the monetary base) sooner than it would otherwise. Or is the increase due to a sudden rise in the demand for M2, which, with the elevated level of the monetary base, would not require additional adjustments. It’s probably too early to tell for sure, but the Fed’s weekly Money Stock Measures, released each Thursday afternoon, will be important to monitor in the weeks ahead. The next chart shows the weekly data on M2 through August 8, which were released last Thursday afternoon. 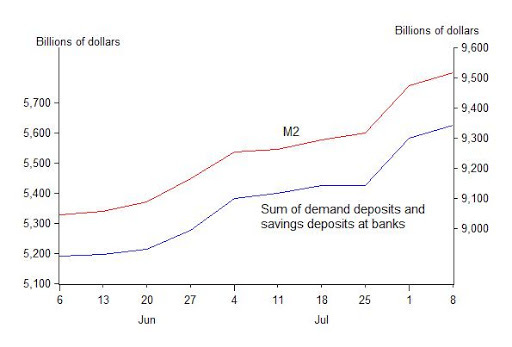 Based on a scan through the release, it looks to me like demand deposits and savings deposits at banks are the two components of M2 that are most responsible for the recent increase in M2. I have plotted the sum of those two items below M2 in the chart to demonstrate this (note the dual scale with M2 on the right and the sum on the left). Other components of M2 such as currency, small denomination time deposits, and other checkable deposits have not increased in this way. What’s the reason for the sharp increase in demand deposits and savings deposits at banks? 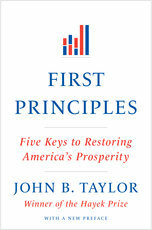 Perhaps the collapse of interest rates on Treasuries and the risk that Treasury prices could fall from these high levels have made such deposits more attractive, recalling the phrase of Keynes that the bond bulls “join the bear brigade.” The newly announced policy at Bank of New York Mellon that large depositors will have to pay to lodge their funds is consistent with this story. If so, we are seeing a shift in the demand for money. But stay tuned.